The STATES Type FMS Semiflush-Mounted Test Switches provide a compact, versatile means to disconnect, test or measure devices and circuits in panelboards such as relays, metering, control circuits and other instrumentation applications. 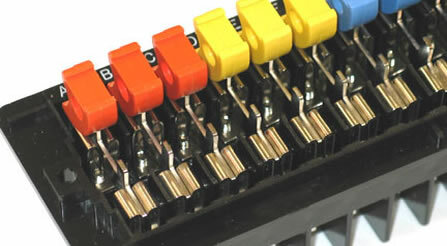 The FMS Switch works without instrument transformers being disconnected from secondary wiring. Please call 800-325-4574 for engineering drawings on the 10 & 14 Pole Cutout dimensions.